I first met MaryLee Sachs in 2009, when she brought Twitter’s Biz Stone to the Cannes Lions Advertising Festival. Working for PR giant Hill and Knowlton at the time, her team kindly let me chat to Biz about Twitter’s dizzy rise to success (worth a retrospective look at now given their current ubiquity), and then I got a few minutes with MaryLee to get her thoughts on PR and social media, and how public relations was being seen more and more part of the marketing mix. I personally do not have a formal PR background. I fell into all this advertising/marketing/social media/SEM caper, so have been able to see things through un-fettered eyes much of the time. I had to seek out some text books to understand that PR is really about building and maintaining the long-term reputation of an organization. But as MaryLee was discovering – and not afraid of exploring – during her time at H&K, was that with the rapid rise of digital and social media, brands need to look at the real-time reputation engines turning the turbines of likes, shares, retweets and react more swiftly to not just positive pixel-inches, but also take advantage from a marketing and ,dare I say, SALES perspective. In the “Changing MO”, MaryLee continues her quest to educate the industry and provide very real insight into brands from the US and UK, and even has time to include global behemoths as well. The format is clever. 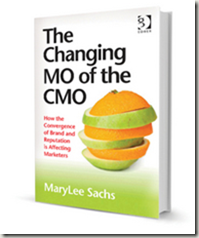 She simply interviews the CMOs to understand their approaches to this new world of inextricably linked communication departments, how they are structured, where they found problems, what they did to overcome them and delve into anything unique about their operation. 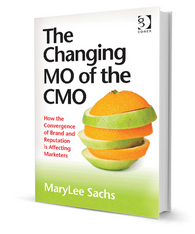 The book profiles marketing leaders like Jeffery Hayzlett, formerly of Kodak (here’s a jolly interview I did with him earlier this year), Jon Iwata from IBM, Ann Lewnes from Adobe, Amy Curtis-McIntyre from Old Navy, and Harry Pforzheimer from Intuit. In all, there are 10 profiles with org charts and all sorts of luscious data and sound-bites to keep students and budding CMOs more than engaged. Rather like the espresso I’m supping as I write, this book is a short sharp hit with a well thought out conclusion to the PR/Social/Marketing conundrum (which includes sage advice from one of my favourite marketing gods – Marc Pritchard from P&G). Some might balk slightly at the $40-odd price tag, but if you’re going to manage multi-million dollar budgets, it’s a small price to pay for some current thinking in a digestible form. If you don’t have $40, then follow MaryLee on Twitter – she’s free……kind of!